A Southern Region film following the route from Waterloo to Southampton. There is a diversion to the GUILDFORD to REDHILL line with scenes mainly in 1963 with S15 and Maunsell moguls prominent. The Southern main line has visits to WIMBLEDON, WOKING, FARNBOROUGH, BASINGSTOKE, MICHELDEVER and WINCHESTER. The Didcot, Newbury and Southampton Railway is covered in the early 1960’s with T9 and Western motive power. 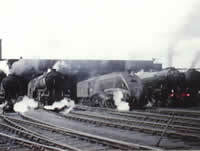 Travelling south-westwards via SHAWFORD and ALLEROOK we reach EASTLEIGH with 9F and Britannia types mixing it with various Southern types including C14 and un-rebuilt Bulleids, even 35028. 3440 CITY of TRURO puts in an appearance. HAYLING ISLAND branch scenes, LONGMOOR, not on an open day! and SOUTHAMPTON DOCKS with a T9 and B4 joining the usual USA tanks. The QUEEN MARY was in port. Filmed from 1959 to 1966 this production has fascinating and sometimes rare views of the Southern Region at work with many different classes and some visitors as well. The majority of the film is in colour and an informative commentary has been added with an authentic soundtrack.